that cannot wait any longer! Ancient Olympics were invented when the World was led by warriors. Today's World is led by creative entrepreneurs and innovators. Innompics are the long overdue response to new realities. Olympics are for athletes. Innompics are for World changers. helps to strengthen a breakthrough venture sharply ‒ within just few hours! Innompic Games is a too disruptive change for prospective partners. It's impossible to get any major player on board. Thinking big, but starting small. Founders and their friends have enough funds and skills to develop all the necessary concepts and technologies. 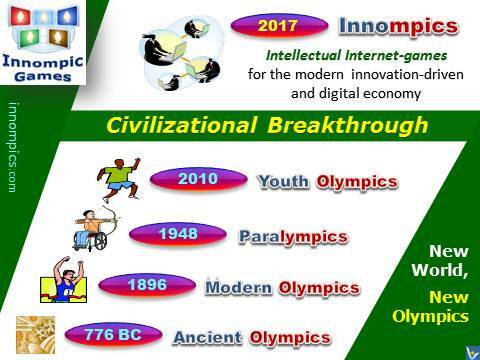 They have also good international connections to ensure that enough teams take part in the 1st Innompic Games.